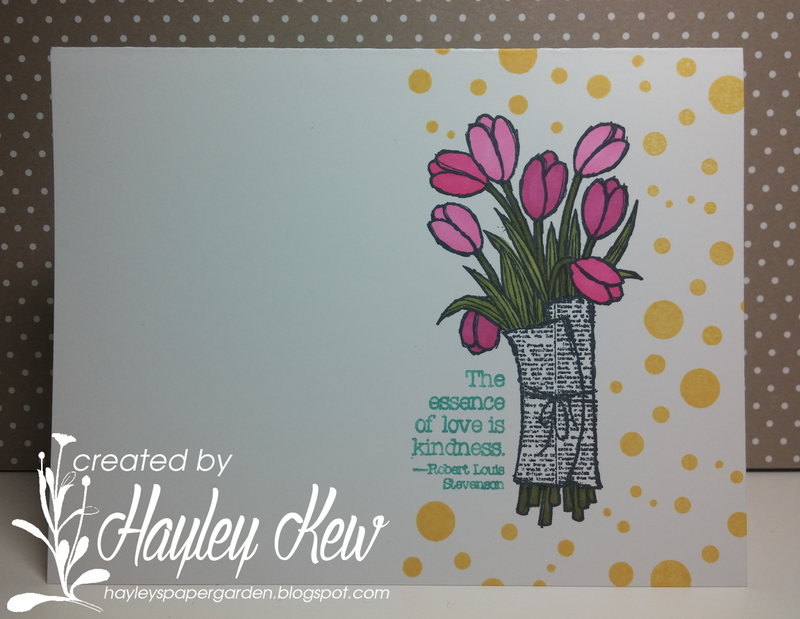 Hayley's Paper Garden: Stampin' Royalty Open Call for Guest Designers!!! Good evening all! I was browsing through blog land today and noticed that the lovely team over at Stampin' Royalty is having a Guest Design Team Call :) I so enjoy playing along with their challenge and thought it would be fun to through my name into the hat... We were asked to create and share 3 projects with them using exclusively Stampin' UP! products - so here we go! As most of you know my passion is paper crafting but I do also really enjoy digital scrapbooking so I thought it would be fun to create two cards and one page to share with the ladies over at SR! Project #1 was created with the sketch from Sunday Stamps, the colour theme from ColourQ, the tic tac toe game from The Paper Players (I used Flowers, Shade of Pink & Polka Dots) and the spring theme from CASology. 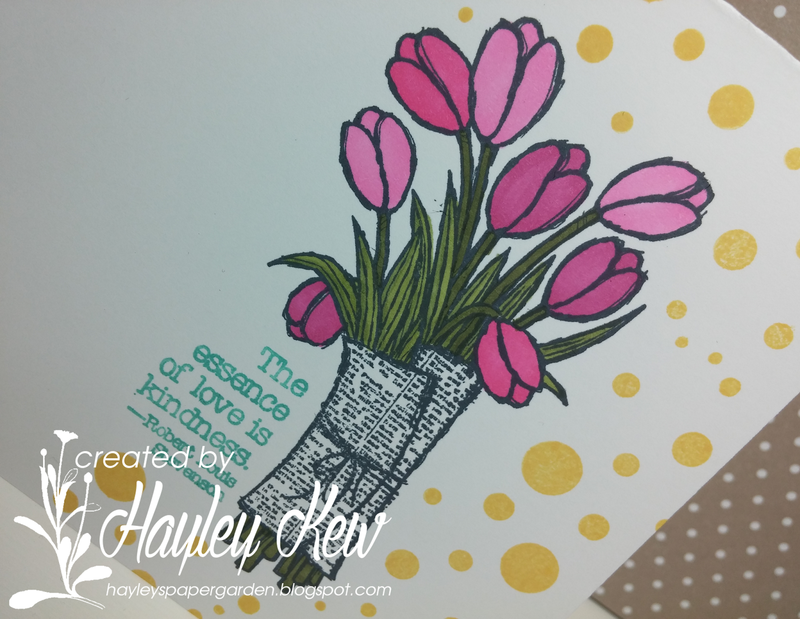 Project #2 was created with the sketch from Create with Connie and Mary, the colour theme from Pals Paper Arts and the spring/flower/doily theme from Just Add Ink. Project #3 was created with the sketch from MDS Monday. Great projects! I love the dyed doily and pretty flowers on the second one. Thanks for joining us at the Pals Paper Arts. What a cute scrapbook page Hayley! I love the wooden word bubbles!!! Such a cute idea. You're always so clever. Thanks so much for joining us this week at MDS Monday. Beautiful! Love how you added a different color drop shadow to the text. very cute page, my daughter is sitting with me and she says she likes the way you added the word "fun!" she thinks its cute and so do I. glad you joined our challenge this week! Some great projects. Love your scrapbook page - it has a very happy feel to it. So exciting to see you at Just Add Ink and your card is gorgeous. Just love the flower stamp you used and the peachy colour is perfect!!! Hope you can come back again!! What an adorable digital page! So bright and love the elements you used! Hayley, I love the springy card and the colors you combined for CASology...very cool newspaper holding together the pretty tulips. Thanks for joining us at CASology this week! Three lovely projects Hayley - I love the addition of the the doily to the background of your second card.Love your MDS scrapbook page too! Thanks for joining us over at The Paper Players and Create With Connie and Mary this week. What fabulous projects! That is such a fun scrapbook page. Great use of the sketch. Thanks for joining us at MDS Monday this week. 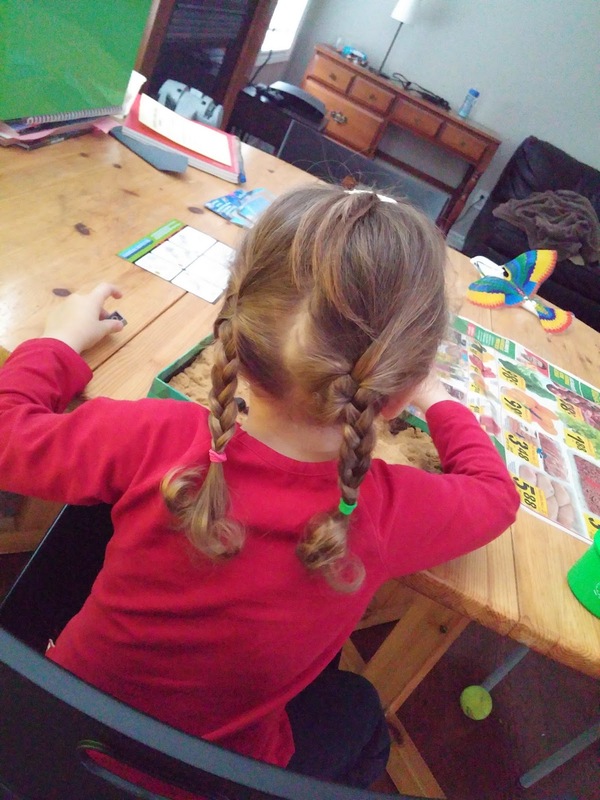 What a lovely take on the inspiration photo at Just Add Ink this week! Super projects all the way around Hayley! Thanks for sharing with us at Create with Connie and Mary! Hayley, both your cards are gorgeous but I especially love the first one and the way you highlighted the bouquet with those fabulous yellow dots! Thanks for playing along with CASology this week! I love all of your projects! Thank you for making Create with Connie and Mary one of them - you did a great job with the sketch! I especially love the sponged doily as the background for your flowers - really pretty! All of these projects are wonderful! What an inspiration to craft or even play in the sand! ;) Love your spring take on the Create with Connie and Mary sketch challenge. Thanks for playing along this week! They are all lovely projects Hayley. You captured the key colours from the inspiration photo and used them beautifully. Thanks for joining us at Just Add Ink this week. Fabulous projects! Love all of your attention of fun details! Wow, great projects. So glad you chose to share them with us at Pals Paper Arts! Great use of the colors! All your projects are lovely! So pretty how you colored the doily and used those soft colors for your spring flower card! Thanks for joining us this week at Create with Connie and Mary! Love the projects! The flowers with LOVE across them is so striking! Love the colors, too! Thanks for playing along with the sketch challenge this week on Create with Connie and Mary! Both of your projects are just delightful! I love how you used the half doily behind the flowers then the words right across the top. Thanks for playing along this week in the Create with Connie and Mary Thursday Challenge! Hayley, your daughter is beautiful! Such a sweet smile. You nailed the one layer challenge at SS and anything with a doily and flowers is right up my alley! Thanks for playing along with Sunday Stamps this week. Paper hugs. Your work is so beautiful! Very inspiring! Thanks for submitting to our design team challenge. I really like how you did the shadow behind your word on the digital scrapbook page! Congratulations on being selected as one of our Guest Designers at Stampin' Royalty! Glad to have you join us! Visit Stampin' Royalty for more details.